Yes yes, we know gluten free living has become trendy but it’s also very real for those suffering with gluten intolerance or Celiac disease. Celiac Awareness Month is quickly approaching next month so we thought we’d prep by sharing some allergen free goodies! BFree Foods has a dense line of non-GMO gluten free breads, bagels and wraps to ease the stress and limitations of gluten intolerance and Celiac disease. And they’re on a roll with their nutrition profiles. BFree has much more fiber than your typical gluten free bread with a shorter list of ingredients. Uniquely, they have a pea protein blend in the mix so you can get your muscle fix. Additionally, their products are low in fat and calories! Donut you wanna know what they taste like? Does the BFree Bagel rise to occasion? The quinoa and poppy seed crunch on the multi-seed bagel adds a depth of texture and flavor. We dough know about you, but gluten free bagels were a new odyssey for us. Although structurally bagel-esque, they lack the chewy texture we clamor for in bagels. The multi-seed bagel was a bit crumbly and needed to be toasted to hold up to sticky peanut butter. Our tip: add vegan butter after toasting the bagels to moisten um’ up. 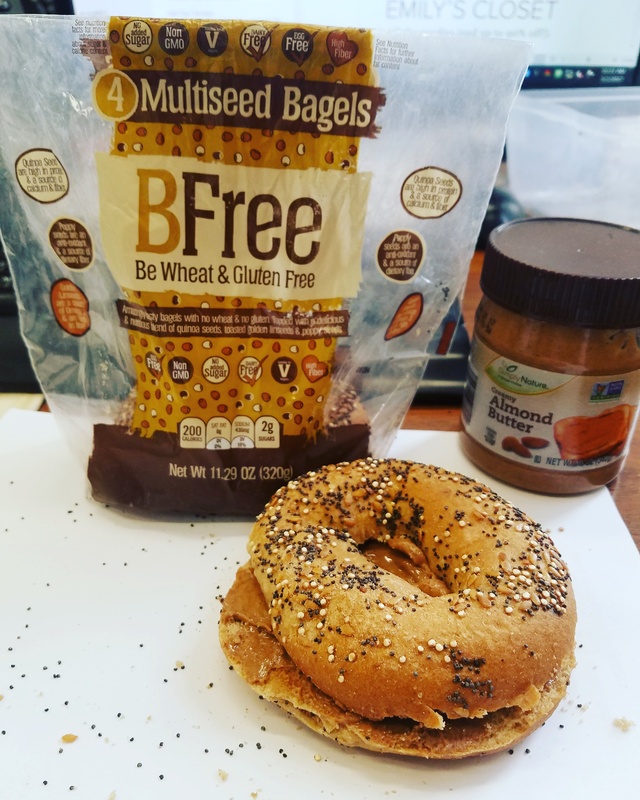 On-the-Go Breakfast: BFree Multiseed Bagel with Almond Butter. 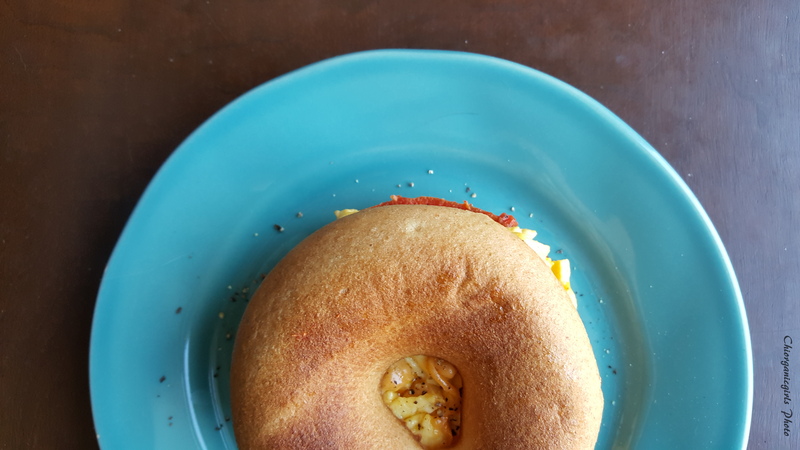 Eggs, vegan Daiya pepperjack cheese and BFree Foods white bagel. Other gluten free loaves? Baguette-about um! These loaves are cut length wise, making them perfect for paninis and tasty for toast. They are also hole free so your toppings won’t slip through the cracks. The bread could have a bit more flavor but it’s mild nature makes it suitable for any topping. The Soft white sandwich bread is perfect for tea parties or any gatherings when you have friends and family members with different allergies. 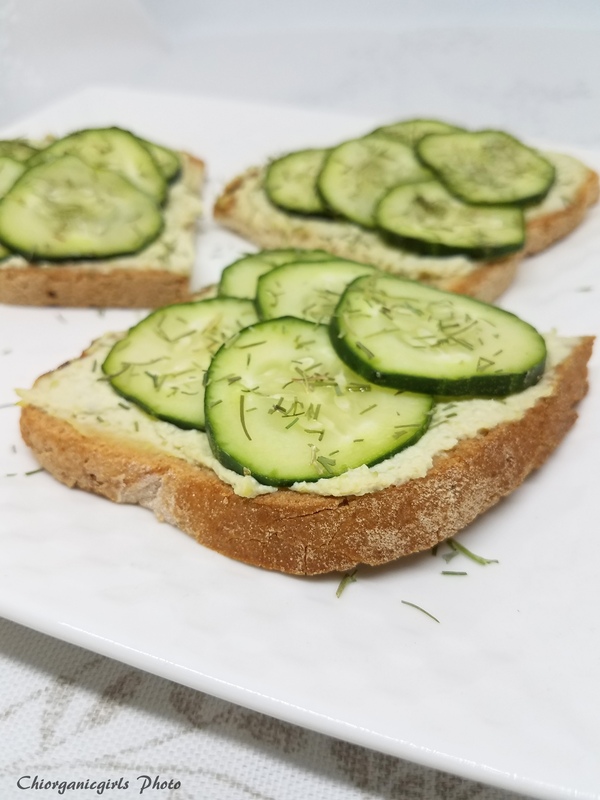 Tea Time with BFree Foods white loaf spread with Latana (formerly Eat Well Embrace Life) Edamame “Hummus,” cucumbers and dill. 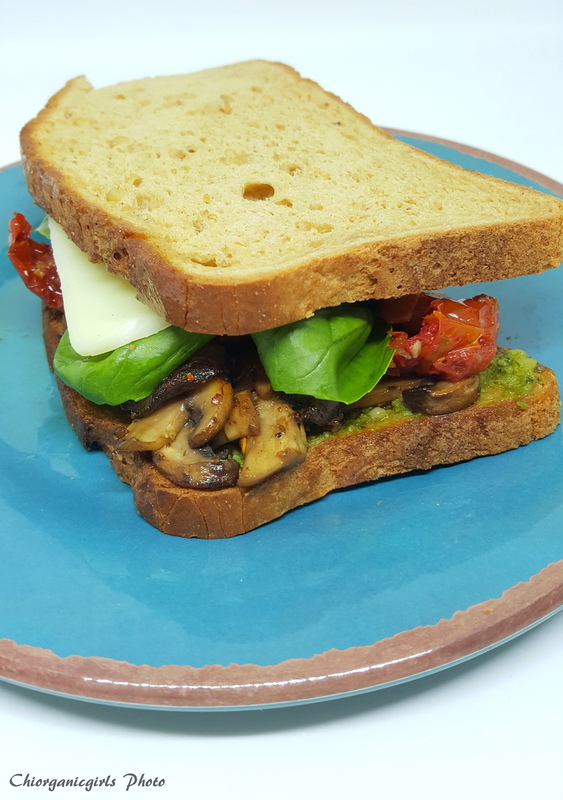 BFree Brown Seeded Loaf with pesto, sauteed mushrooms, basil, spinach, sundried tomatoes and Lucrene mozzarella cheese. The buns are not your typical hot dog buns but are a great substitute, although easily breakable. We created vegan banh mi sandwiches with the brown seeded buns for our friends and they loved it! 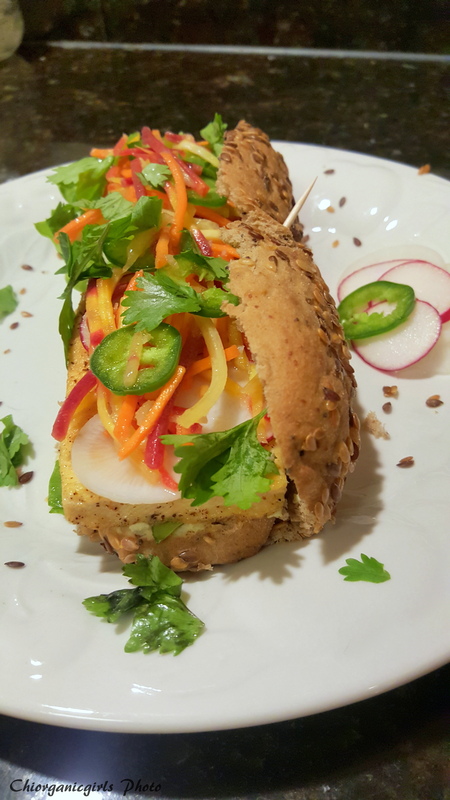 Vegan banh mi sandwich with Nasoya marinated teriyaki tofu, organic carrot slaw, white and red radishes, lemon vinegrette, jalapeno, cilantro and BFree Brown Seeded Bun. The white rolls mimic a dense ciabatta and make a solid breakfast or dinner sammie holder when toasted. Get decadent and spread some garlic sea salt coconut ghee on the brown seeded roll before topping! 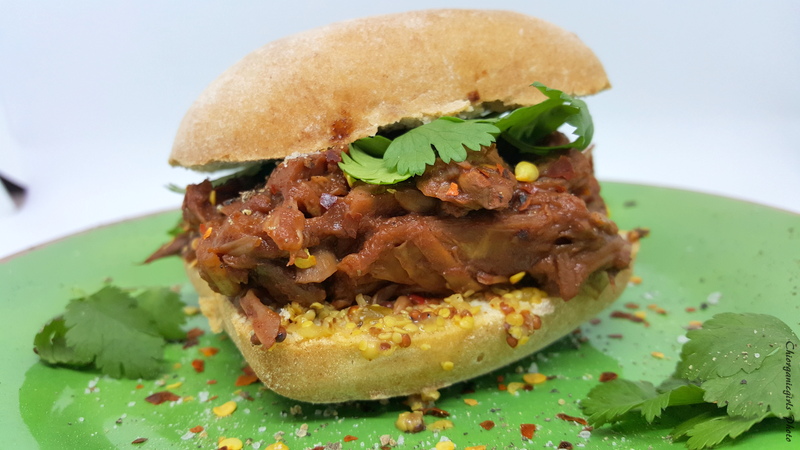 Vegan BBQ Sandwich with BFree White Rolls, Upton’s BBQ Jackfruit and Local Folks Foods mustard. We are curious about the sweet potato wraps and the quinoa chia seed and flaxseed wraps. The only other brand of gluten free wrap we’ve tried was formed from rice flour and the wrap had too stiff of a texture. Are you bready to crummmmble with BFree foods? You can find them in Jewel-Osco in Chicagoland or search for a spot near you here to enjoy bready goodness without the gluten.